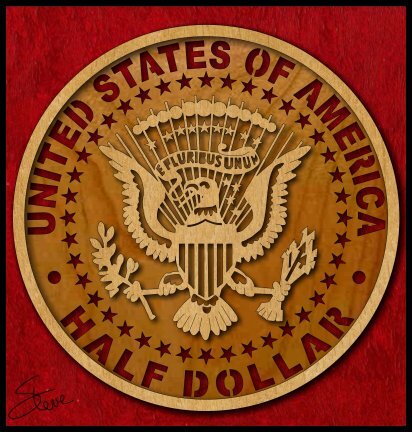 US Half Dollar Scroll Saw Pattern. 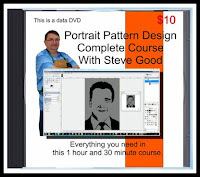 This pattern is what I call a challenge piece. You cut this project for the challenge. I think it will look pretty cool hanging on the wall of an office. It is thirteen inches in diameter. 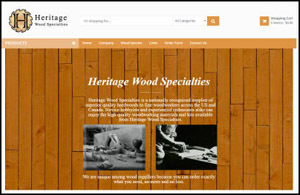 I would recommend Baltic birch plywood for this project. 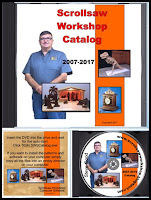 As you can imagine, I spend quite a bit of time thinking about new subjects for scroll saw patterns. I was cleaning out my office desk drawer and came across a nice shiny US half dollar. I was just looking at the beautiful carving and thought maybe that would make a cool scroll saw pattern. I started doing the front of the coin then decided I like the back better. I may go back and do the front to have both. Personalized Signature Coins are Back! 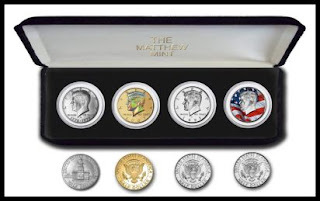 The cost is $12 per sheet of 12 coins plus $3.50 shipping. I can put two sheets for a total of 24 coins in an order. 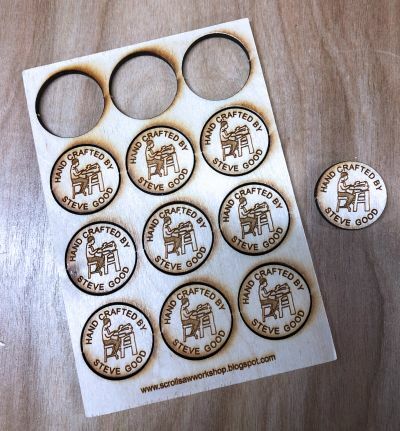 Some of you may remember that I sold laser engraved signature coins last year. These wooden coins are embedded into those special projects that you want to show your pride in. They're back. I have made some changes. 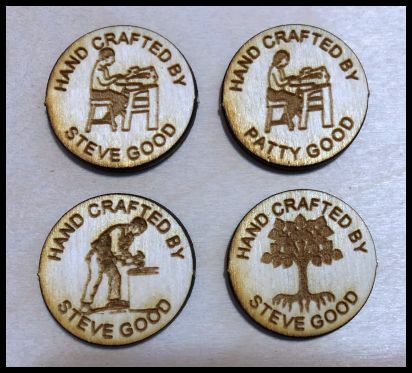 The original coins were engraved on individual pre-cut coins. They were well received but I was not as happy with them as I wanted. I could not control the registration and thickness of the coins to the degree I was happy with. The pre-cut coins were also subject to small amounts of warping. The new coins now come in sheets of 12. 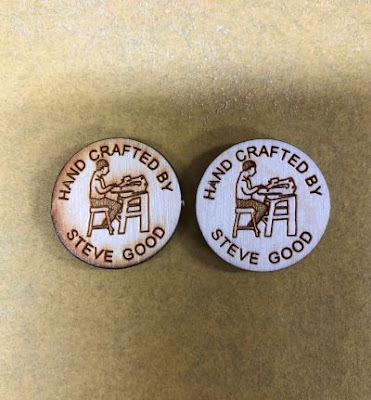 They are engraved and then cut leaving two small tabs. They are easily pushed out of the card when you need one. The registration of the engraving is now exact and the thickness is a consistent 1/8". I have redesigned the male and female scroller for a more polished look. 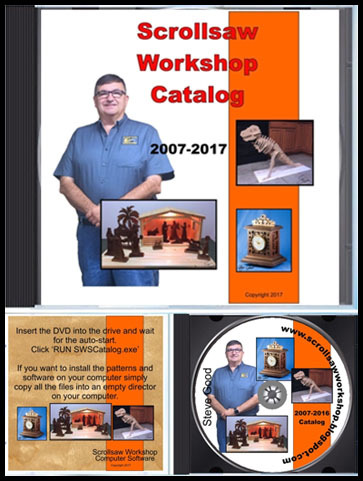 You will have the four designs above to choose from. 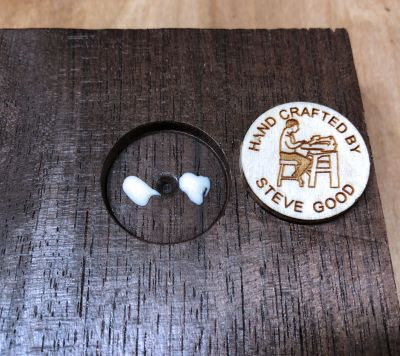 After you push out the coin you can lightly sand it to get rid of the laser burn. Some people prefer the weathered look of the burn. It's your choice. 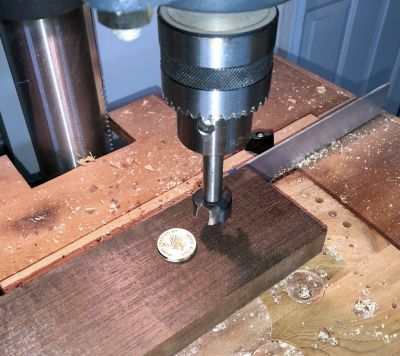 A 1" diameter Forstner bit is used to drill a hole 1/8" deep to accept the coin. 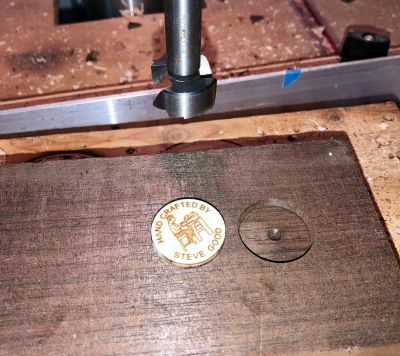 You can drill the hole slightly deeper to help protect the coin face. This helps if the coin is on the bottom of the project and prone to scratching. 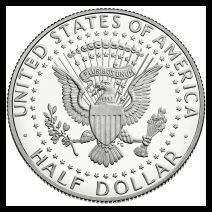 It's best to sand any remaining tab from the side of the coin. A couple small dabs of glue and you can insert the coin. 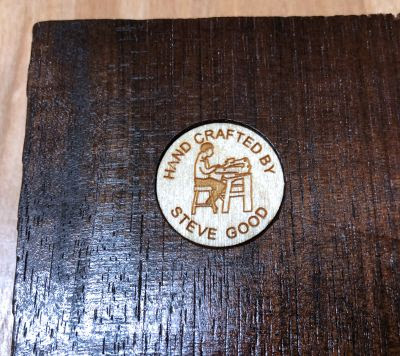 Use the finish of your choice right over the coin to protect it and your project will show your pride in your work.